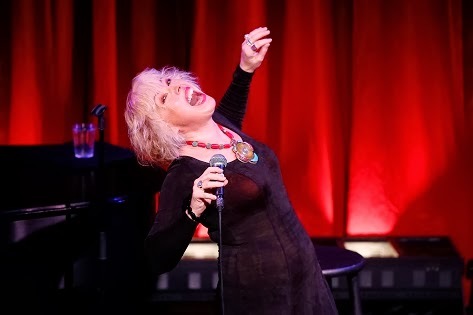 Barb Jungr explores what she calls the “New American Songbook,” distinguishing it from the traditional lounge fare of the “Great American Songbook.” Hers is cabaret forged in the crucible of folk and rock. Jungr reinterprets Dylan, McCartney-Lennon, Leonard Cohen, Kristofferson, and Carole King. Hers are tantalizing readings of the lyrics and music. Familiar tunes by Neil Diamond, Joni Mitchell and Hank Williams are teased to fit her style. 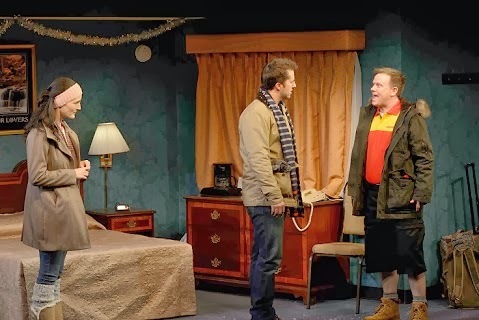 “Dancing in the Dark,” at 59E59 Theaters through December 29th, Jungr says is just what we’re all doing. Her show is about muddling through the long winter nights, heartache and the human condition. Yes, that’s Springsteen’s “Dancing in the Dark” in the title and on the bill. But it’s Cohen and Bob Dylan who are Jungr’s main soul mates. 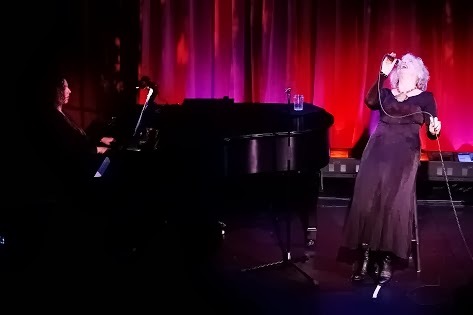 Humor moves Barb Jungr through the gloom with which she flirts so casually. Jungr rocks hard, with passion and intelligence. Lucky are her fans who did not come as late to know her as did this reviewer. A highlight from the playlist is Jungr’s own “Till My Broken Heart Mends,” written with Michael Parker, which she sings with her talented pianist, Tracy Stark. Hurry, visit www.59e59.org for tickets; the show runs through Sunday December 29th. 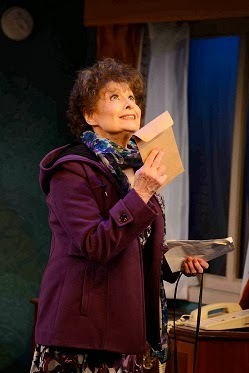 Broadway legend, Carol Lawrence (Tony nominated for her role as Maria in the classic “West Side Story”) is Edna in Jason Odell Williams’ comedy-drama-romance “Handle With Care,” at the Westside Theatre/Downstaits. Directed by Karen Carpenter, the play for an ensemble of four runs through March 30, 2014. Photo by Doug Denoff. It’s easy enough to acknowledge that the heart is a delicate organ. 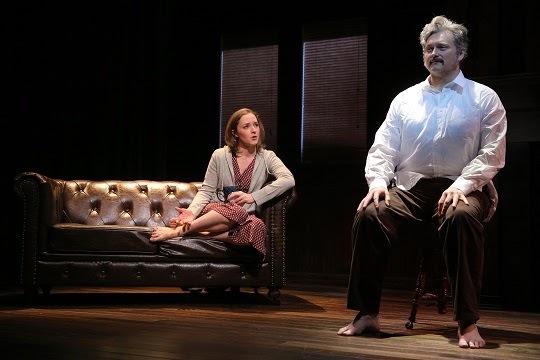 In Jason Odell Williams’ “Handle With Care,” at the Westside Theatre through March 30th, a trip to America is meant to help heal a broken heart and revitalize an old flame. These longings of the heart lead to strange coincidences in this charming little dramedy. 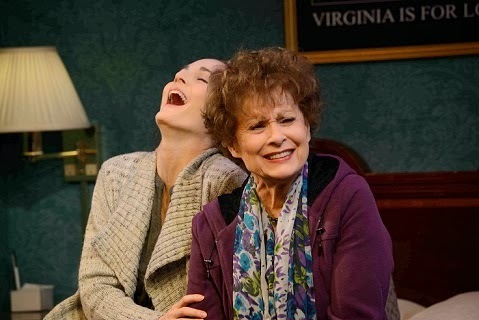 Charlotte Cohn and Carol Lawrence in Jason Odell Williams’ “Handle With Care,” at the Westside Theatre/Downstairs, directed by Karen Carpenter. Photo by Doug Denoff. Edna (Carol Lawrence, Tony-nominated for her role as Maria in “West Side Story”) brings her granddaughter Ayelet (Charlotte Cohn) with her from their home in Israel on a quest in small-town America. While at a motel in Goodview, Virginia, Ayelet’s beloved “safta” dies and she entrusts DHX to ship the body home. DHX may be reliable but shlubby Terrence (Sheffield Chastain) is decidedly not. “Handle With Care.” Photo by Doug Denoff. “Handle With Care” opens with Ayelet name-calling Terrence in Hebrew over the loss of her grandmother’s body. In desperation, Terrence calls in his boyhood buddy, Josh (Jonathan Sale) to interpret. “You speak Jewish, don’t you?,” Terrence implores. Cohn’s Hebrew rant is wonderfully mellifluent. It has spice and plays beautifully off Chastain’s naif dumbfoundedness. As the play moves back and forth in seamless and well-placed flashbacks, the cast under Karen Carpenter’s direction makes the most out of the situation. “Handle With Care” is a holiday romance, in all senses of the word– love, adventure, with a touch of the supernatural– and it is utterly enjoyable. For more information about “Handle With Care,” please visit http://www.handlewithcaretheplay.com/. 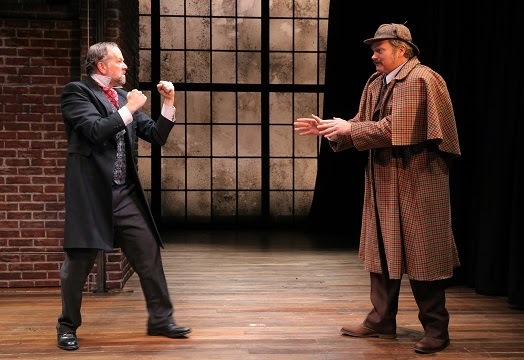 David Costabile and John Ellison Conlee in Madeleine George’s “The (curious case of the) Watson Intelligence” at Playwrights Horizons under the direction of Leigh Silverman, and playing through December 29th. Say “Watson” and I think Sherlock Holmes. Apparently so does Madeleine George, the author behind “The (curious case of the) Watson Intelligence,” at Playwrights Horizons through December 29th. George does not limit herself however merely to the one Watson, but also imagines Alexander Graham Bell’s assistant, Thomas Watson, and the IBM computer that beat Jeopardy’s best. All the “Watsons,” (John Ellison Conlee,) including the fictional one created for the play who is a techie on the “Dweeb Team” aim to please. They are, in many ways perfect companions, whose desire to serve their “master’s” and divine their needs. As helpful as Watson is, so obstructive is Merrick (David Costabile). In his various incarnations as a techno-phobic paranoiac, as an inventor out to destroy his wife, he is the least likable man on the stage, not to say the planet. Eliza (Amanda Quaid) is the object of Merrick’s affections and distrust. Granted, she is not the only one he distrusts. Merrick’s rants against the government are poisonously amusing. Eliza is building a computer, based on IBM’s “Watson,” that will understand what she wants. A great asssitant anticipates your desires. Eliza’s encounter with the techie Watson whom her husband, Frank Merrick, hires to follow her confuses her emotional landscape. In him she finds the living embodiment of the robot she is designing. Eliza with the Watson robot she is programming: Amanda Quaid and John Ellison Conlee. Photo by Joan Marcus. The concept, nicely executed by the actors under Leigh Silverman’s able direction, is neat and fascinating, but like human interactions unpredictability. In many ways, the idea behind the play is frittered away by the many paths the plot takes. It’s an entertaining and thought-provoking foray, but it ultimately disappoints. Opera and the operatic have been good to David Henry Hwang. “M Butterfly,” a unique retelling of the grand opera, “Madame Butterfly,” won the Tony for Best Play and BD Wong as a Featured Actor in 1988. John Lithgow was a nominee for Best Actor in this huge Broadway hit. Hwang has also worked on operas with the likes of Philip Glass, Bright Sheng, Osvaldo Golijov, Phil Collins and Howard Shore. “Dance and the Railroad,” which was at Signature Center’s Griffin Theatre last season, is not an opera, but it showcases a Chinese opera performer, Lone (Yuekun Wu) and his accolyte, Ma (Ruy Iskandar) as they practice their art while their fellow railworkers go on strike. Hwang is the current Playwright in Residence at The Signature. His next play, “Kung Fu” with Cole Horibe as Bruce Lee, will have its world premiere in February-March 2014. For more information and to book tickets, visit Signature Theatre’s website. French Saved Jazz” at 59E59 Theaters. “Love, Linda- The Life of Mrs.
It’s no canard that the French took to American jazz like a duck to water. Starting in the 1920’s, American musicians fled to the receptive shores of the Seine (and the Riviera) to enjoy a lively and welcoming cabaret scene. Among those were Les Cole Porters, as well as ex-pats Josephine Baker and Sidney Bichet. Bud Powell, Kenny Clark and Dizzy Gillespie felt right at home in France. Duke Ellington and Louis Armstrong also made appearances before an admiring public. 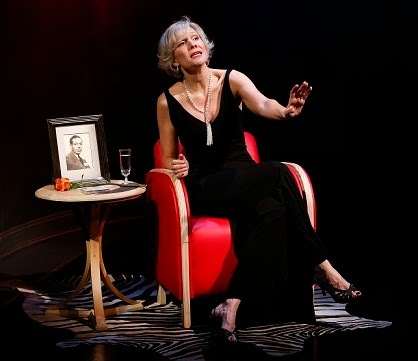 Stevie Holland’s and Gary William Friedman’s “Love, Linda- The Life of Mrs. Cole Porter,” premiering at The York Theatre Company through January 5th, tells the story of Cole Porter as husband. Cole and Linda Porter (Stevie Holland) set up house in one of the fashionable arrondissments and entertained lavishly, and enjpyed the cabaret life of the city. “Love, Linda” documents in story and with songs by Cole Porter (arranged for “Love, Linda…” by Friedman) their life from Europe and back to the States. Cole Porter wrote music for revues, but met his first success wth the Broadway show “Paris,” from which the hit “Let’s Do It/Let’s Fall In Love” emerged. 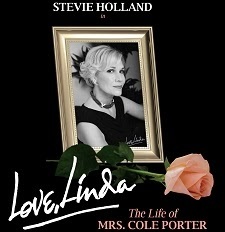 Stevie Holland is Linda Porter in “Love, Linda…” Sets by James Morgan, costumes by Pamela Dennis. Photo by Carol Rosegg. “Love, Linda…” covers a lot more ground than just the Porters’ sojourn in France. Linda Lee Thomas was Cole’s senior by nearly a decade, and married at the time they met. While aware of his homosexuality, she was drawn to his talent and gentleness, a contrast to her first husband’s brutality. Their marriage was more thna just one of convenience. Linda nurtured Cole’s art. Holland is supported by music director Christopher McGovern on piano, Alex Wyatt on drums, and Danny Weller on bass. Richard Maltby, Jr. helms Linda’s story, which is cogently told in story and music. 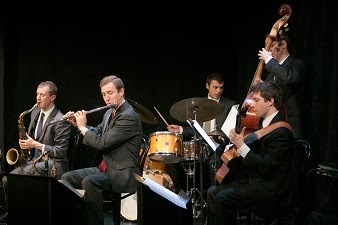 “Le Jazz Hot- How The French Saved Jazz,” at 59E59 Theater’s E-Cafe through December 29th, takes an overview of Paris and its jazz scene from the years when Josephine Baker awed (and shocked) the world to the 50’s and 60’s, when Kenny Clarke and Bud Powell were regulars in the boites. Peter and Will Anderson (sax, clarinets, flute) with Alex Wintz on guitar, Luc Decker on drums, and Clovis Nicolas on bass. (At other performances, you might encounter guitarist Randy Napoleon, bassist Neal Miner and drummer Phil Stewart on the small stage.) The apex of their virtuosity is in the performance of Duke Ellington’s “Paris Blues.” “La Vie en Rose” is pleasantly familiar while Django Reinhardt’s “Manoir de Mes Reves” is hauntingly unfamiliar. Cabaret mixed with informative film clips makes “Le Jazz Hot” an amiable entertainment. For more information about “Love, Linda…,” visit http://www.lovelindathemusical.com/. 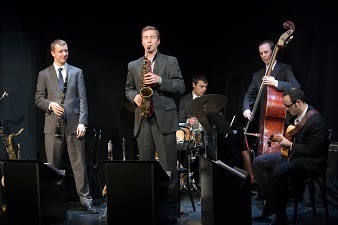 To learn more about “Le Jazz Hot,” please visit 59e59.org.